Even more so than the warming temperatures the joy of Spring, for this artist, is the newness everywhere you look. Everything is fresh and vibrant. Each day there is amazing growth of trees and plants to behold. 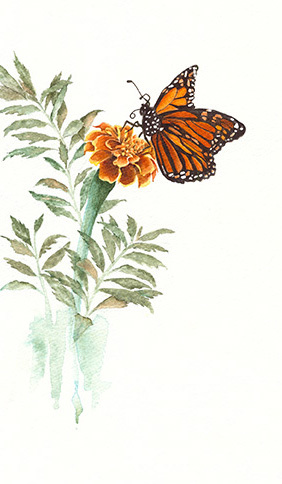 Creating a painting is not unlike a butterfly struggling to shed its cocoon, growing flowers, or growing our lives. The painting process begins by the painter making sure quality art supplies and thumbnail sketches are in order before the preparation of a next canvas. As a gardener, you break up the soil and start anew. Then there is clearing out the dead leaves and roots of the winter. With a good disposition, a gardener must make sure the proper nutrients are mixed in the soil. In representational art, the artist’s painting won’t have enough depth without properly preparing the background and planning for the next phase of the painting. Of course, there are exceptions. I sometimes paint the focal point first but the progression of the painting depends on preparing each stage properly. You won’t get beautiful blooms in life until you first do the work just right. The topsoil in your garden must be aerated and left loosely packed on the surface. The newly formed butterfly can’t strengthen its wings without the painful struggle to break free of its cocoon. Without this battle, the butterfly dies without taking flight. When our gardens are balanced with care we can harvest beauty while living a life of grace and enjoy each stage of the process. Art is a mirror that casts a reflection on our lives. Nurture all you’ve been given, cultivate your garden for sharing your beautiful gifts and plant your seeds for the future. I’ve begun cultivating my next canvas . . . The glorious Spring in Georgia comes earlier than any place I’ve lived. 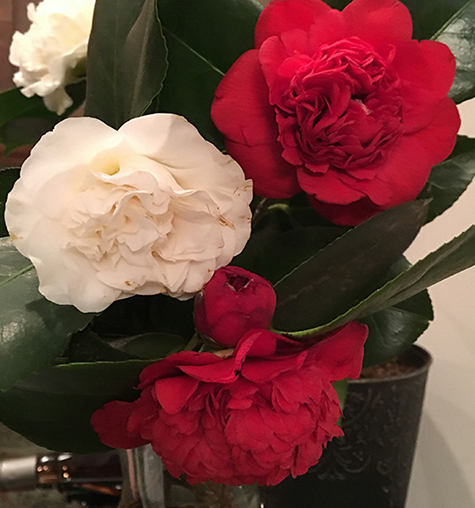 Just a week after the New Year began one of my neighbors picked a bouquet of Camellia from her back yard, a surprise birthday gift as well as a surprise to me that anything was blooming that time of year. Oh, the joy. During the winter I watched squirrels dart along the leafless branches of tall oak trees with moss covered trunks. Oak trees in Georgia grow 45 – 65 feet tall, so straight they look as if they are reaching for the stars. But those cute little squirrels I enchantedly watched seem to like digging up my newly sprouted monkey grass and crocus. Right now I’m rethinking how cute I think they are. The redbud and tulip trees began blooming early February this year, a bit earlier than usual. 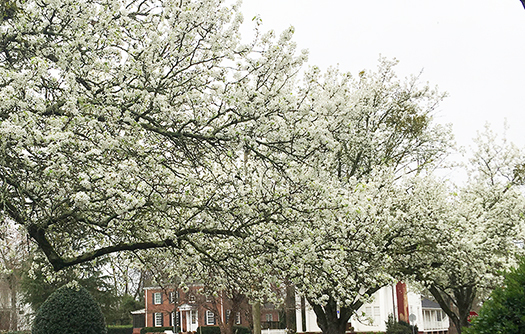 The Pear trees were fabulous and formed a canopy over many of the residential streets. As the blossoms waned it looked as though it was raining delicate white petals in a breeze. Now I’m ready for hummingbirds. I’ll be moving the Spider plant to the screened porch and replacing it with a blooming plant to attract more hummingbirds. 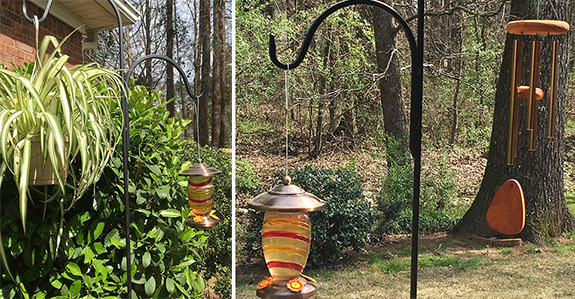 What do you think, will the windchime scare the hummingbirds? March was a month of growth on many levels. A friend that I met in Physical therapy a few years ago suggested a day trip to Gibbs Gardens in Ball Ground, Georgia. I knew I would be walking among millions of Spring flowers but I couldn’t have dreamed of what the extent of one man’s love of gardening could produce. The gardens are closed only a couple of months the year. Each season brings a different kind of beauty. Sixty varieties of Daffodils covered the hills and valleys of Gibbs Gardens, over 20 million blooming between March 1st and April 15th. Several varieties of tulips standing over two feet tall were breath-taking. This was so worth the drive to take in the early Spring display. Jim Gibbs traveled for 15 years covering the nation and the world viewing gardens of every style and decided that he wanted to design and build a world-class garden. He spent six years looking for a suitable site with a strong source of water and beautiful mature trees covering a rolling topography. It was truly “a dream come true” when he found the most beautiful site in the nation to construct the garden. The property is 292 acres and the house and gardens include 220 acres, making it one of the nation’s largest residential estate gardens. I couldn’t resist buying a season ticket to the Gardens. Mr. Gibbs has written a new book about the property and I can’t stop thinking about it. On my return visit for the next season of walking among the flowers I plan to treat myself by taking more pics and purchasing the book. If you would be so kind as to comment below. Black Forest was a great place to photograph. That may have been McKellars, a lovely property with a pond. I painted murals in their master bath. I love having something as simple as my phone (well, simple may not be an accurate term for phones these days) to take photos with. I still have my camera but seldom use it. The earliest photo I have of me was at my aunt’s house. I was a toddler holding a stem of Holly Hocks that was twice my size. Don’t remember how I got the Holly Hock stem. Hmmm. My grandmother had flower gardens, too. I’ve always had a fascination with flowers. Thanks for commenting and bringing back such pleasant memories! this is so beautifully written – i read every word!!!!! Thanks so much for reading my newsletter, Vickie. I’ve never thought of myself as a writer so that felt particularly good. Looks like you have found the most beautiful place to live in, Mickey – perfect for you the flower lover extraordinare!! What an inspiration for you at that garden — lucky you!! The flora and fauna are quite beautiful here. There are many things I haven’t seen in areas I’ve previously lived. I am thoroughly enjoying the wonders of Georgia. Oh my Gibbs Gardens, I want to check out each season! Thanks for reading my little newsletter and I do appreciate your comments. Happy Painting! Hi Linda, what a lovely Spring surprise you are. Thank you for reading my newsletter and commenting. I think of you often and I love seeing Kristy and your beautiful grandchildren on Facebook. Oh please, let’s do make plans for a visit! from:	Kathleen H . . . . . . .
I’m SO happy you are happy there! Hi Kate, so glad you enjoyed the newsletter. I thought you might enjoy the info about the butterfly. Hope you’re getting close to enjoying the beautiful days of Spring in Colorado. It’s taken a while to get settled in but Georgia is beautiful just a different kind of beauty than Colorado. Thanks for writing. Enjoyed the newsletter especially your visit to Gibbs Garden. We have not been, but, have talked about it for two years now. In the fall they have a Japanese Garden Festival which sounds interesting. I don’t know about the wind chimes and the birds. Thanks for including me in your letter. Thank you for reading and commenting on my Newsletter. So glad you liked the Gibbs Garden article. From the photographs I’ve seen every season is beautiful there but I have heard fall is especially lovely. They also have several events throughout the year that sound interesting. from:	Elaine G . . . The Gibbs Gardens look very inviting! To see Flowers in Jan is divine! Experienced that when lived in DC from 2015-2016 but humidity turned out to be more than my joints could handle. Sounds like all is going very well for you and it looks like your new place is probably very charming. Your butterfly art was magnificent! Love to get your updates! Take good care and best of health! It’s always so nice to hear from you. I plan to go back to Gibbs Gardens soon. I would love to see every season. Yes, things are nice at my little cottage. I’m doing more planting in the back yard this spring, Hope to have some blooming shrubs and perennials next year. My White Dogwood trees made it through the Winter! That in itself is worth celebrating.